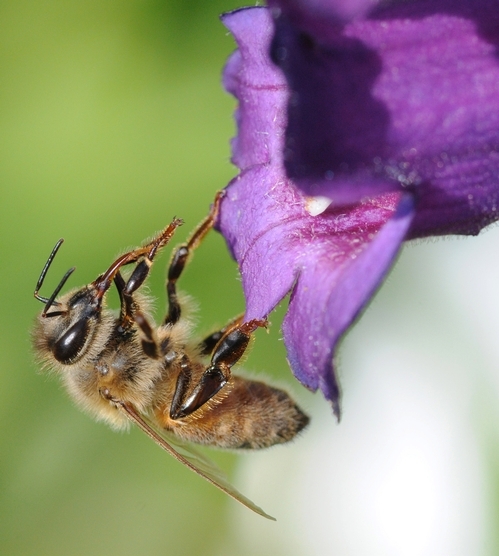 The honey bee nectaring the Penstemon, aka Beardtongue, in Tomales, Calif., didn't seem to mind my presence. 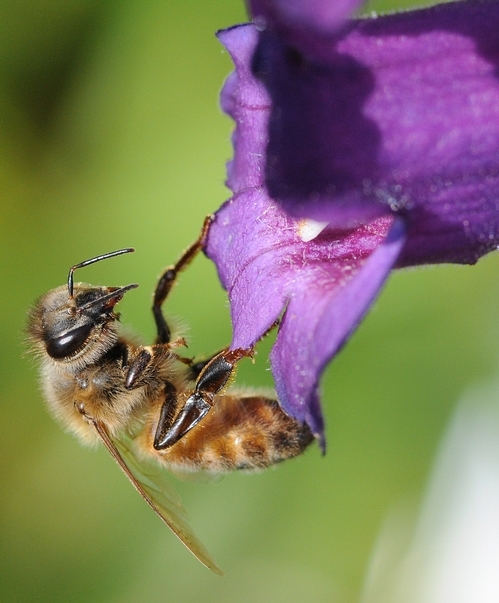 The amber-colored bee was foraging among the purple two-lipped flowers. The plant derives its name from what appears to be a "tongue" (staminode) poking from the "mouth" of the blossom. It's an attractive flower--indeed, humans hold Penstemon festivals in Flagstaff, Ariz. and Holden, Utah--and the bees like it, too. The little Marin County honey bee glanced at me and then began cleaning her tongue. Or, as emeritus professor and pollinator specialist Robbin Thorp of the University of California, Davis, said of the photo below: "Caught in the act of cleaning her tongue with the brushes of hairs on the inner sides of her forelegs." "Even worker bees take time to groom," he said. "Vanity or just good maintenance?" We like to think she was primping for the photo shoot. Bee tongue and the Beardtongue.